I was looking forward to going to Dollywood, just to see what it was all about, but I really doubted that we would need the two-day pass offered for half price at the KOA office. We bought it anyway. Once again I had a preconceived idea of what it would be like, especially after seeing the main drag of Pigeon Forge — glitzy and loud. Again, I was surprised, this time, pleasantly. 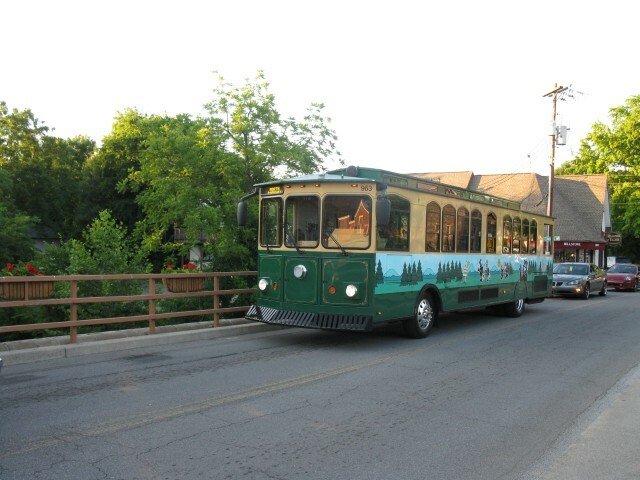 Almost at the door of our campground, we boarded the Trolley car that travels around the town, picking up people and delivering them to the various tourist venues. The cost, just 50 cents per person each way! It wasn’t worth putting on gear and taking the bike up the hill for that price. Besides, it was threatening rain, and we did get some during the morning. That meant not such a crowd of people and no long waits to get into things. 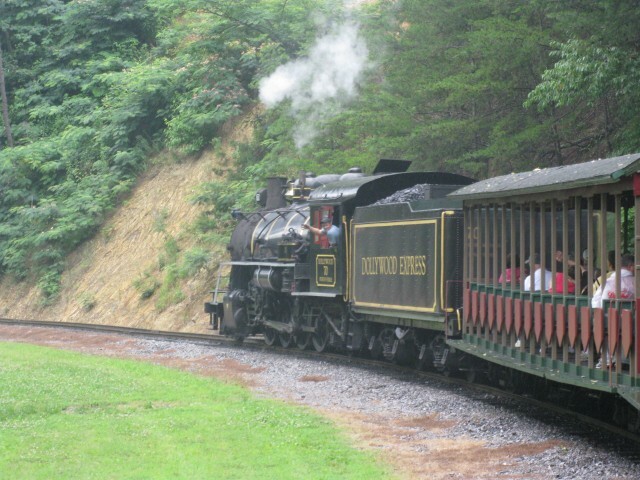 There are no flashing lights, nor garish billboards at Dollywood, and it’s located well off the local streets so doesn’t create a distraction. Dolly has done it up very tastefully, making use of naturally treed land,and various artifacts from the days of her childhood. The price of tickets is much less than what we’d have to pay at Canada’s Wonderland, or Disney World, and it’s not all about rides and carnival games. Our first stop, after grabbing a coffee at the Sandwich and Pastry Shop, was The Front Porch, a covered outdoor theatre area extended from the front porch stage of the replica house where Dolly was born. For a half hour we enjoyed listening to the sweet harmonies of Dolly’s Uncle Billy Owens, her cousins and niece, accompanied by Dolly’s Family Reunion Band. From there we walked to the train station to catch a ride around the park on train, pulled by an original coal-fired steam engine. Jim especially enjoyed listening to the whistle tunes played by the engineer. There were only two things at the park that cost extra. The first one, of course, was food, and that was expensive — $21.00 for two pulled pork sandwiches with a small bag of potato chips and one ice tea for lunch. The rain had finally stopped by the time we finished eating and we strolled down to the Wilderness Pass, where the roller coasters, zip lines and a few other challenges were located. 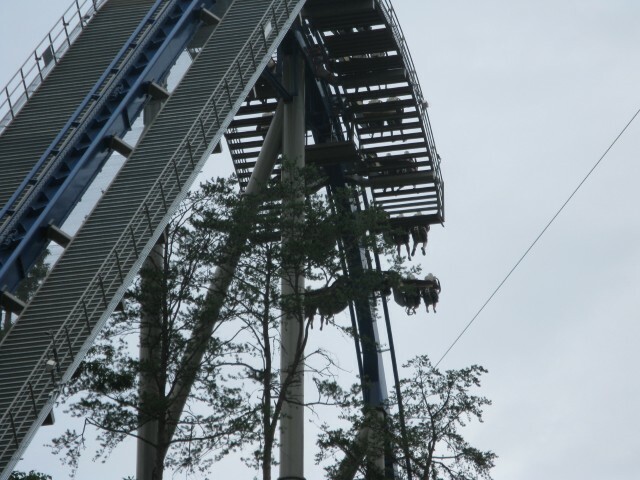 The Wild Eagle looked like a “must do!” Up we went, and down we went, hanging on for dear life and enjoying every minute of it. I can’t believe I’m saying that, since even as a child and up to the time of my mid-life turnaround, I would never go near anything more “scary” than a Ferris wheel! At Timber Canyon we survived another roller coaster ride called Thunderhead. It was at first easy until we were suddenly plunging head first into a coal mine shaft! Yikes! 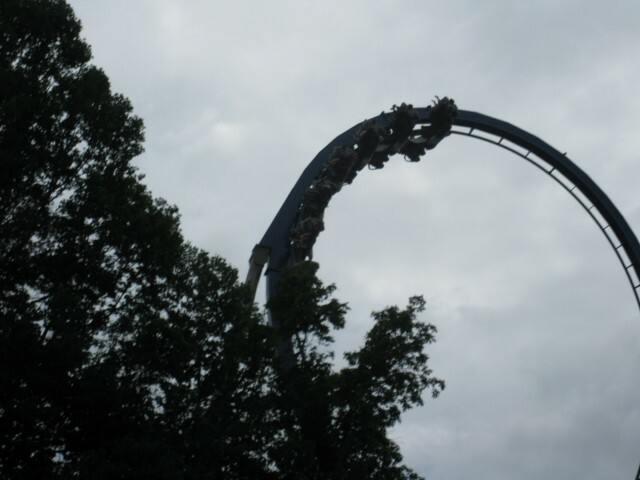 It was as rough ride and not nearly as much fun as the Wild Eagle. 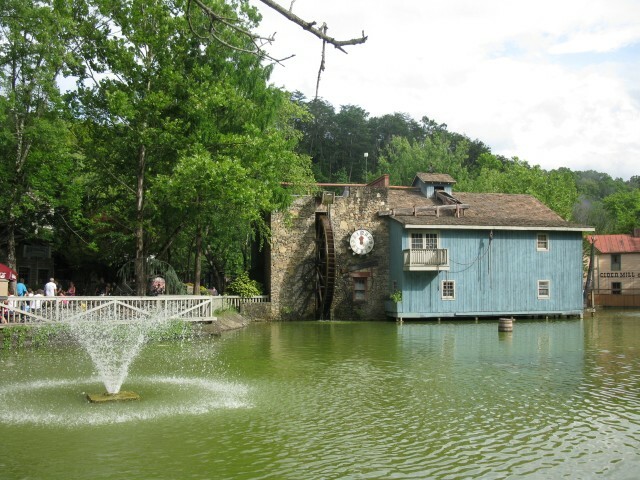 We asked about doing the Zip Line, but since there was an extra charge of $30.00 per person, we passed. 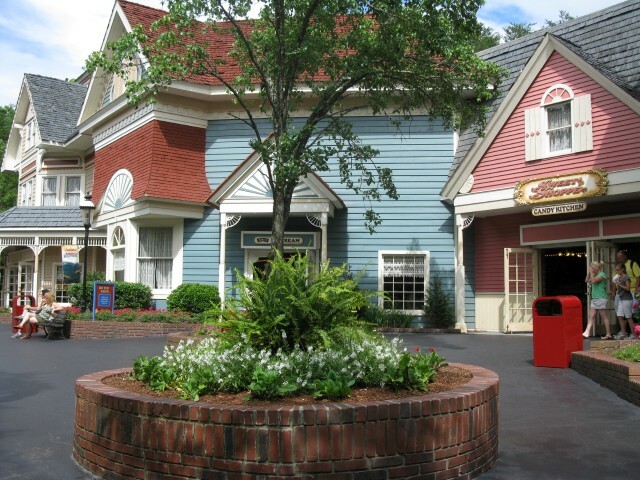 There are lots of little shops and restaurants in the park, but we went into only one shop — Dolly’s Closet, a ladies clothing and accessories shop, where I expected the quality items to be much more pricey than they were. We toured the Chasing Rainbows Museum, and hoped to get a peak inside Dolly’s touring bus, but it wasn’t open that day. There were a few things that we could have gone back to see and it would have been nice to listen to some more music, but by five o’clock we’d had enough and caught the trolley back to camp, sticking to our original plan to leave on Monday. It was another great day. Tonight, Monday, we are at another KOA at Renfro Valley, Kentucky, on our way home. 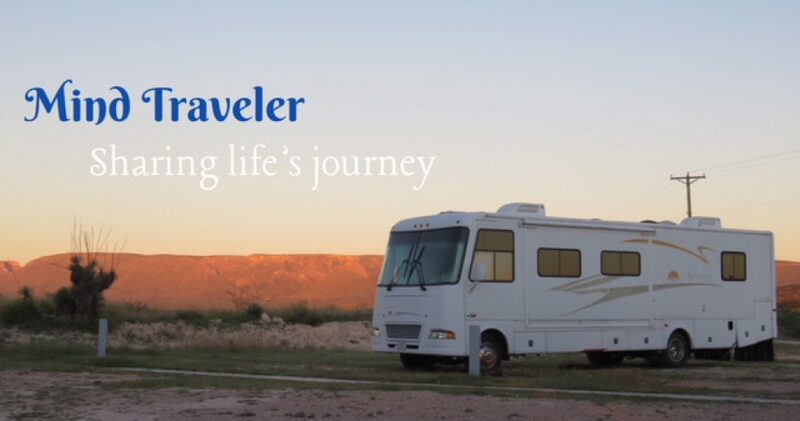 This entry was posted in Motorcycling, RV Travel, Travel and tagged bikes, Dollywood, motor home, Pigeon Forge, RVing, Tennesee, travel. Bookmark the permalink. 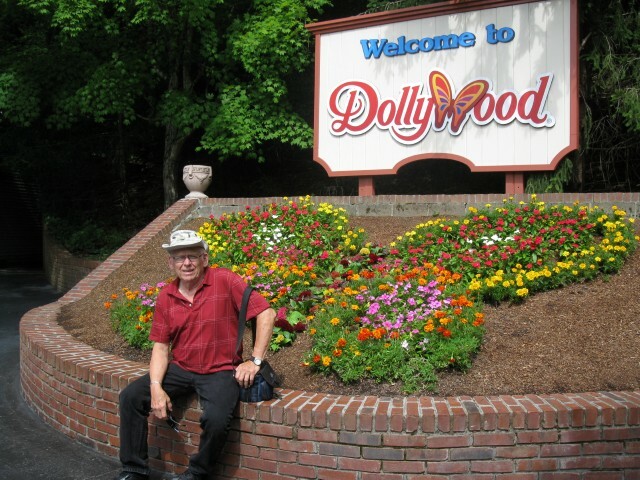 Dollywood always sounded like a fun place to see. And if I never make it, after reading your blog, I feel I just enjoyed a day there.Thanks. You’re welcome, Felice! I’m glad that you enjoyed the tour. Hi there, I discovered your site by means of Google even as searching for a similar topic, your web site came up, it seems to be great. I’ve bookmarked it in my google bookmarks. Thanks for stopping by Levi. Be sure to click “follow” if you want to know when there are new posts. Dollywood looks it was a pleasant surprise, especially given the glare of Pigeon Forge and Gatlinburg. Maybe we’ll go next time we head down that way. I think we’ll take our food and skip the rides though.